Manzanita, Oregon: On January 27, 2019 the Tillamook County Sheriff’s Office Search and Rescue team was activated to assist the Manzanita Police Department with a search for a missing Portland area man. 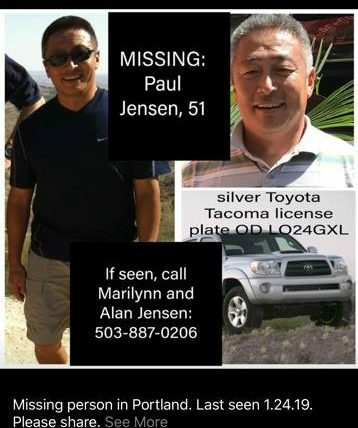 The subject, identified as Paul G. Jensen, age 52 from Portland, was initially reported missing to the Washington County Sheriff’s Office on January 26 by family members. On January 27, Jensen’s vehicle was found unoccupied in Manzanita, Oregon by Officers from the Manzanita Police Department who then requested assistance from the Sheriff’s Office with the search.